Yeah. We're not entirely sure if we're actually allowed to use the words "Super" and "Bowl" together without a conjunction between them, and apparently LG can't, either. But come on--we all know what this promotion is about. This week, LG announced that in the lead-up to the game named after Excellent Strigiformes, the company's B8 Series OLED TVs are being discounted by as much as a thousand bucks. That includes the 55-inch OLED55B8PUA, which is now $1,499.99 (down from $2,299.99) and the 65-inch OLED65B8PUA, which will set you back $2,299.99 (instead of $3,299.99) until February 2. LG Electronics USA has launched a limited-time promotion on its critically-acclaimed LG OLED 4K Ultra HD TVs to the lowest price ever for an LG OLED TV now through Feb. 2 at LG-authorized retailers nationwide. 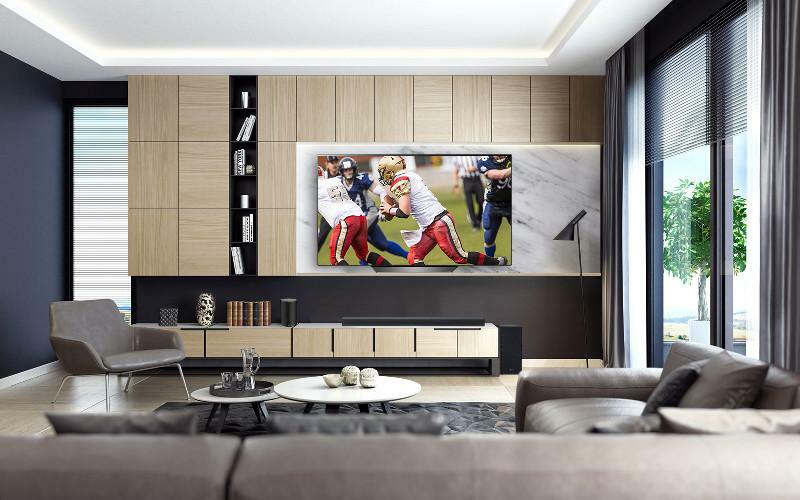 "If you can't be at the big game, there is no better way to enjoy it than on an LG OLED TV," said Tim Alessi, head of home entertainment product marketing at LG Electronics USA. "We are very excited to offer consumers a chance to elevate their experience with this limited time promotion on our stunning LG OLED B8 TV." LG, the first to introduce the transformative OLED pixels to large screen TVs, offers the widest selection of models on the market. Detailed technical reviews from noted experts worldwide have hailed LG OLED as the best TV technology ever, thanks to LG OLED's unique ability to create its own light. All 2018 LG OLED feature 4K Cinema HDR, providing comprehensive support of all major high dynamic range formats including Dolby Vision as well as HDR10 and HLG, both with LG's advanced tone-mapping technology that provides scene-by-scene optimization. LG OLED TVs were the most-awarded TVs at last week's CES 2019. For more information on LG OLED B8 with AI ThinQ, visit lg.com. • Check out our TV Reviews category page to read similar reviews. • Read HomeTheaterReview's 4K/Ultra HD TV Buyer's Guide.